Well, a little bit about me. Hi, my name is Jessica McAvoy, and I have a love affair with culture. I admit that sounds a bit like an introduction to a traveler’s anonymous meeting. Art, wine, food, language, landscape, and people. I enjoy the thrill of being on the back of my hubby’s BMW motorcycle. OK, journey by motorcycle? The idea was nuts to me…until we spent five months touring through Europe on a motorcycle. I enjoy the thrill of all things that encompass travel. I feel at home on the road. Change and experiencing new surroundings are the wind in my sails. In 2014 after three trips to Hawaii, a long weekend in Spain, and a handful of trips around the US northeast all in one year, my husband Daryl (aka Red) and I came to a decision for change. We were no longer into the rat race of living on Long Island, owning a home, and living just to work for our careers. On average we would spend 40+ days a year away from home. Planning our next trip before returning from the last became the norm. It was time to embrace what we loved instead of fighting against it. We live every day as if it is the first day embarking on a new adventure. It keeps life exciting and keeps us living in the moment. Hi! 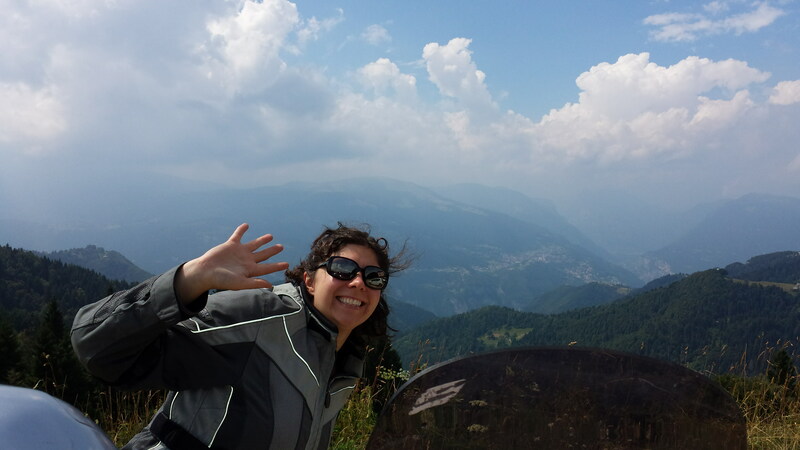 I am Jessica McAvoy, and this is me on a motorcycle trip in the Italian Dolomites.